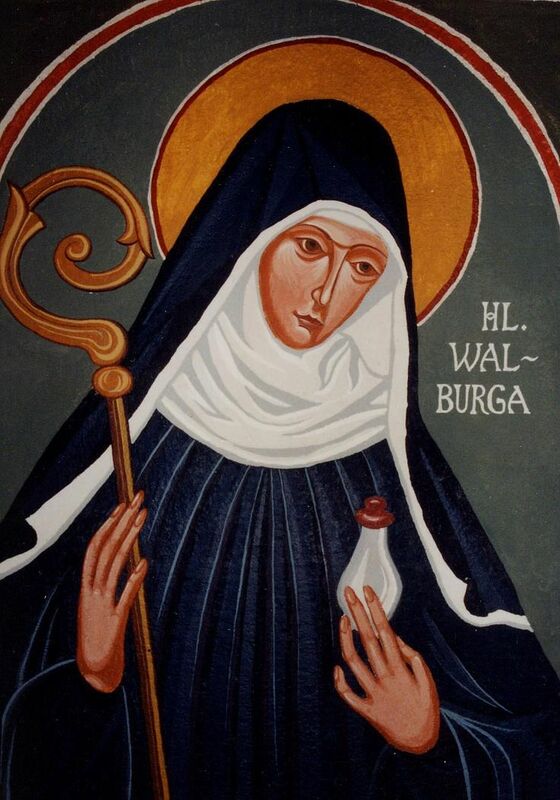 Surprisingly the misinformation that Anglo-Saxon Benedictine nun Walburga (710-779), who proselytized in Germany (ironically in Heidheim, “Heathen Home”) is the originator of Walpurgis’ Night and that it is a Catholic holiday is a wide-spread one. This is even something promoted by German bloggers on wordpress, one of them even mentioning that “some” believe there “might be” Pagan roots to this holiday, but “this has never been definitively proven”. A rather strange claim to those who have researched sources other than wikipedia or the countless Pagan and witches’ forums, groups and pages on here. No. No. No. 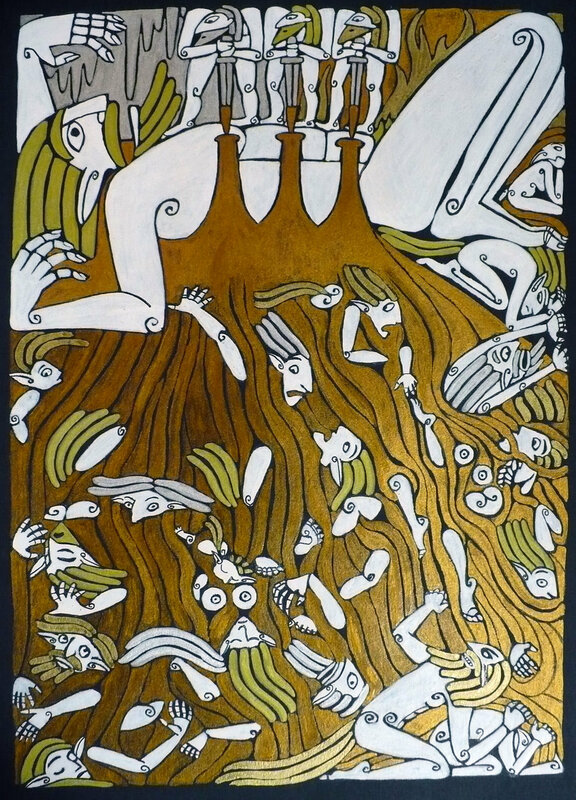 The Christian nun Walpurgis/Walburga had *nothing* to do with Walpurgisnacht, the ancient Pagan holiday…! A translation of the name Walpurgis might already shed some light on the meaning of this holiday. Wal is a word with many translations and meanings, amongst other things, it means “large” and “staff”/”wand” but also “chosen” and “corpse”. 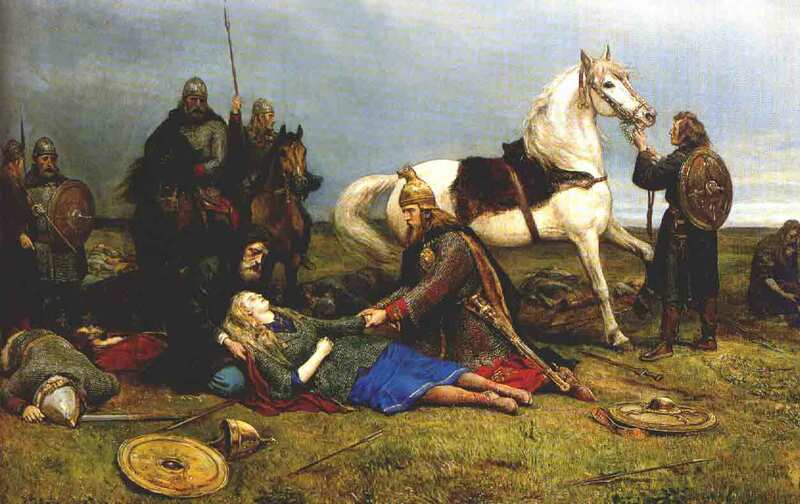 For example: The Walküren (Old Norse: valkyrjar) are the ones choosing the corpses off the battlefield. These Einherjer will fare to Walhalla, the hall of the slain, the chosen warriors, and reap the rewards of their bravery. 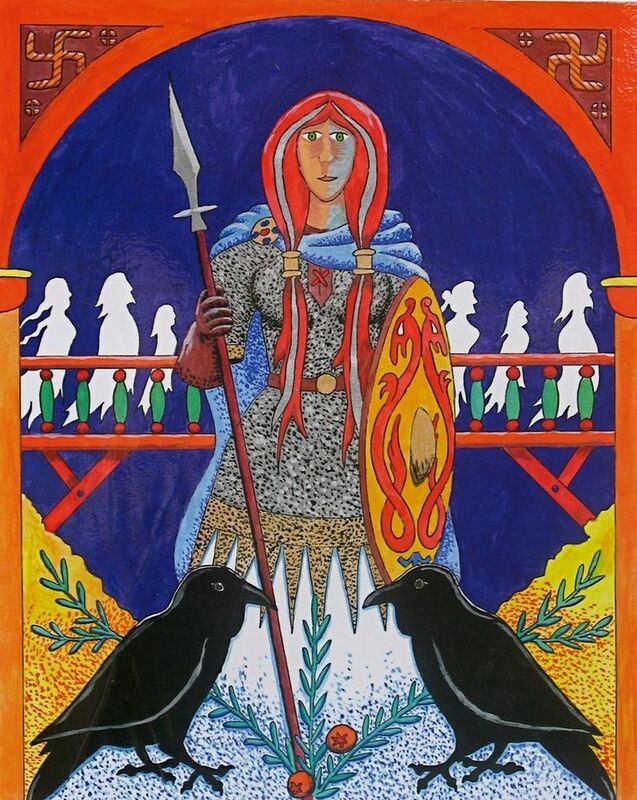 As already mentioned on this blog in https://paganmeltingpot.wordpress.com/2014/09/05/its-a-girl-thing-germanic-heroines-warriors-seers-witches-and-goddesses-part-1/, Waluburg (Walborg, Walburg) was also a famous seer of the Semnone tribe. Naturally, her wand was her instrument of power and she was believed to – metaphorically – carry inside her the (knowledge of the) fate (=life and death) of her tribe if not mankind in general. This is the origin of the (term) “mental pregnancy” that various occult traditions adopted about a thousand years later. Walpurgisnacht was also called Hexennacht (witches’ night). Magic conducted on this night would “ripen” especially fast and “be born” in the course of May, the ultimate “birth-month”. Purgis for once is related to the German word Burg, homestead, castle and to the word Berg, mountain, and it also means motherly womb. 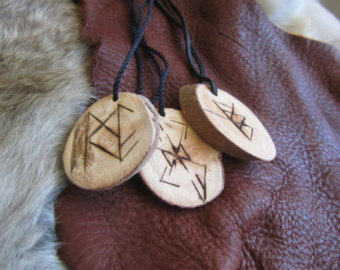 The rune Berkana in which the German words “Burg” or “Berg” are being preserved, is the “May”-rune, the birch-tree rune, also known as the rune of birth, rebirth, (fertility), motherly nourishment. What does Berkana look like? Like a big-breasted and pregnant woman from the side. 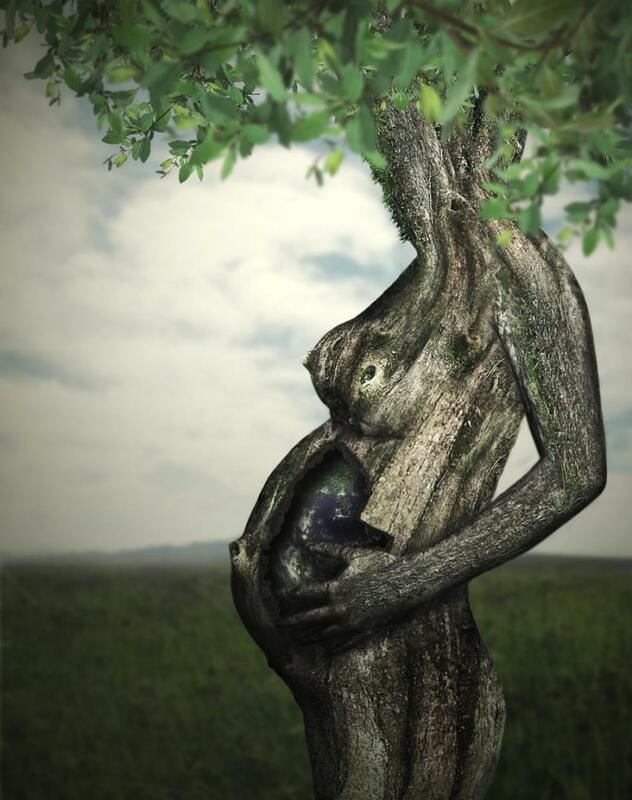 Mother nature at the height of her life. 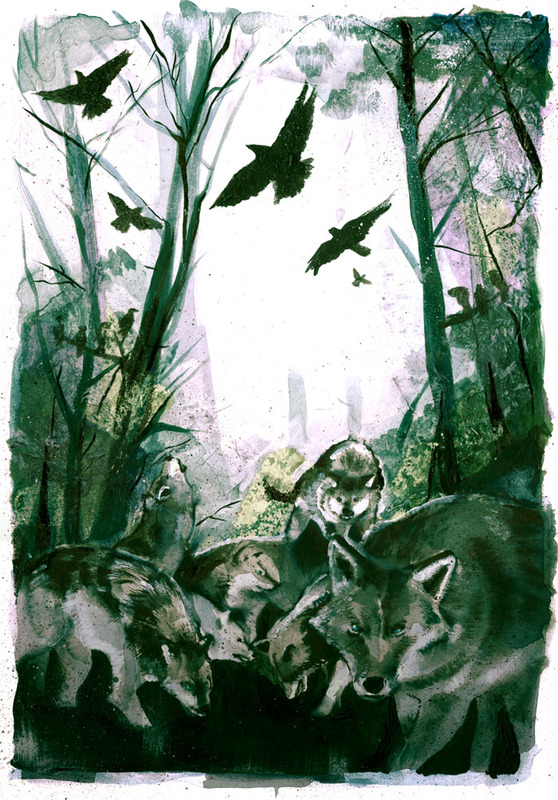 Around the time of Walpurgisnacht nature really is “pregnant”; about to give birth to the fruits and flowers of the forests and fields, animals are having their litters, nature is basically exploding with new life. 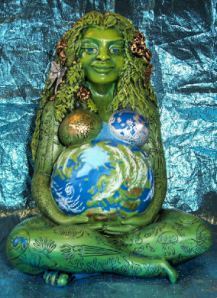 The cycle of life, especially birth was not only viewed as something sacred but also female mystery and magic. Metaphorically speaking we are all being suckled at the breasts of mother nature around this time of year: She is the great sustainer, the nourisher who is encouraging us to be fertile, to be productive, to create. This is why the spirit of especially fertile creatures was “invoked” during this time also – the rabbit and the hen especially. We already know that Christians also stole Easter, amongst many other things, but indeed the idea of easter eggs and putting up small figurines of rabbits, chicks and spring flowers is a Pagan one. 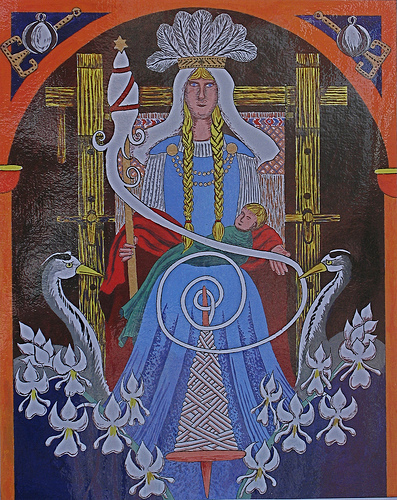 It is unclear whether Eostre (“Ostara” – Easter) was an actual Germanic Goddess or a figure like Frau Holle that was later apotheosized or whether she might have any correlation to Norse Skadi, the “hare-headed” Goddess. This might be a blog post for another day. Anyhow, May is also the time of year we still celebrate Mother’s Day in Germany and as far as I know also in several other Northern European countries. Needless to say, the Christian Church hated the idea of women holding such a special, sacred and “powerful” role as creators of life and weavers of magic. The whole Christian religion appears to have been built on males’ inferiority complexes mainly anyhow. 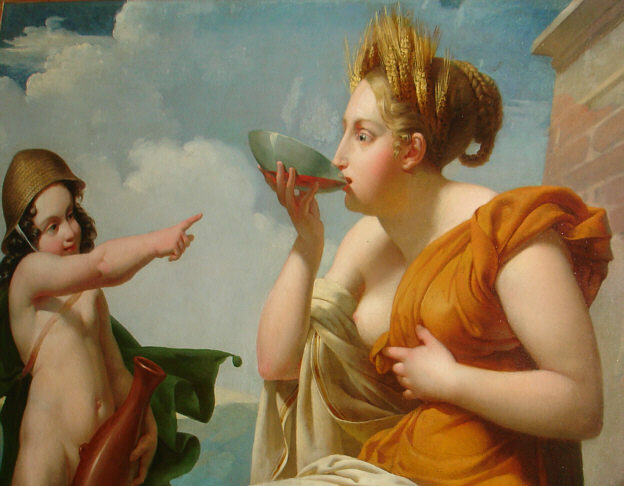 The idea of pregnancy not conceived by the “holy spirit” but ordinary means, was a constant reminder of “original sin” and to celebrate it a sacrilege and an outrage. In the spirit of Exodus 22:18’s “Thou shalt not suffer a witch to live”, magic was condemned and banned just the same. Like with so many other Pagan festivals and holy days, the Christian monks had trouble weeding out the beliefs and celebrations associated with Walpurgisnacht and thus claimed it for themselves. Conveniently the above mentioned nun Walpurga was made the Christian matron of this celebration, May 1st was dedicated to her. And suddenly the holiday was not so much about birth but about warding off evil witches and ungodly powers. 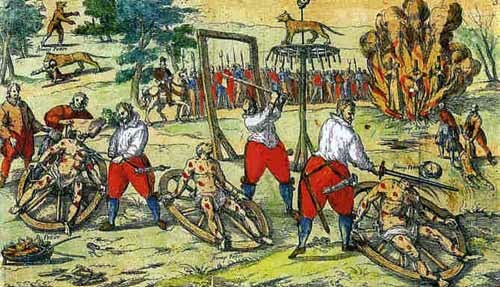 As if that was not enough, it was also the day in the middle ages, on which evil witches were hanged, drowned, burned and otherwise tortured to death during public spectacles. This event was then lavishly celebrated with dance and song. This is why it is exceptionally hard to bear that even today’s Pagans and Heathens subscribe to this Christian nonsense. 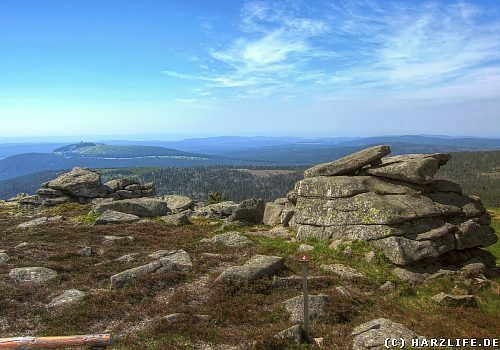 Many Pagans of different traditions gather at the Blocksberg (Brocken area, Saxony-Anhalt/Germany), a mountain (“Berg” > Berkana!) of age-old spiritual significance, and celebrate in a manner that does not befit this blessed day of Mother Nature giving birth. 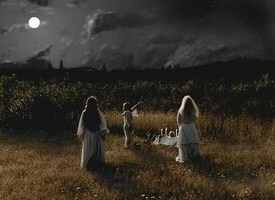 There are several other disturbing traditions that modern Pagans and witches follow without questioning them even once. Why? Because they read them online or in “some medieval book”. 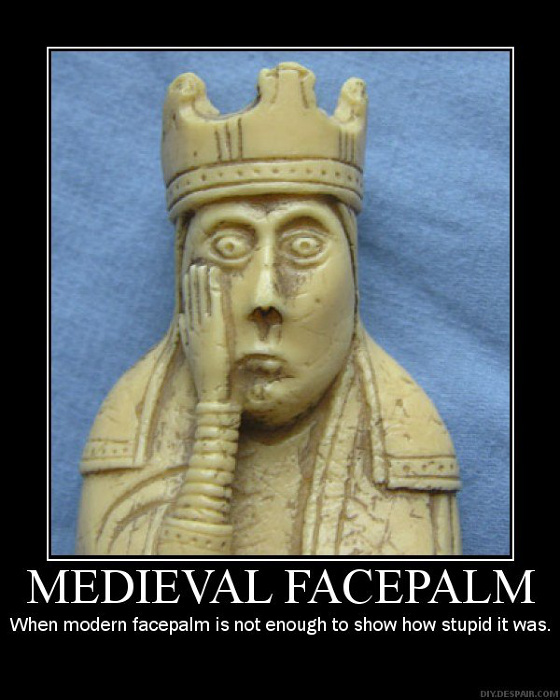 Those who have read the accounts of Tacitus or Cesar on the Germanic tribes know that just because a book is ancient, it is not necessarily completely true. These two above mentioned Romans were experts in confusing facts and even names. So how can we reconstruct Walpurgisnacht? Even Felix Bartholdy Mendelssohn Theodor Storm or Johann Wolfgang von Goethe had it more right than most of today’s polytheists. One of our German “Bauernregeln” (country sayings/folk lores) states that “Ist die Hexennacht voller Regen, wird’s ein Jahr wohl voller Segen”. (If it rains during the witches’ night it will be a year full of blessing.) Another indication of this holy day being a celebration of fertility and (re-)birth. Despite brutal Karl the Great’s conversion of the Saxons to Christianity the “Tanz in den Mai” (dancing into May) remained a beloved and popular religious holiday here, up until today. 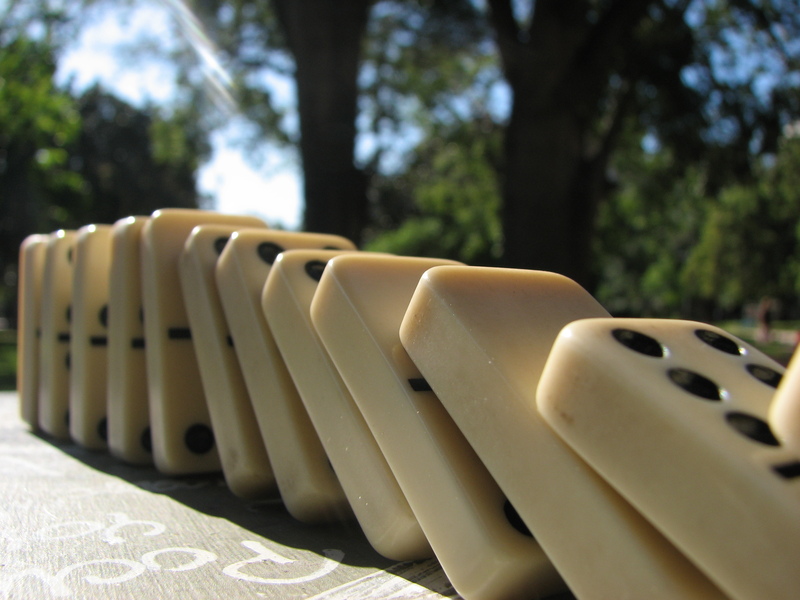 Dancing around a Maypole – think about this. The Maypole symbolizes the phallus. (In our case Ingivi-Fro/Saxnot-Balder’s phallus). The men and women dancing around this pole were blessing his fertility, they were celebrating life itself and ultimately the union or the end-result of the union between “the God and Goddess”. Our Irish brothers celebreated “Beltane”, not only etymologically related to the Semitic/(Hittite)God Baal or in the North “Balder”. If you want to celebrate a more authentic Walpurgisnacht, do “freestyle” as much as you like, but always remember the actual reason and intention of this sacred day. Dance around a Maypole, is invoking the powers of the Mother, “Frija” and Saxnot or her/his equivalent, depending on your tradition. 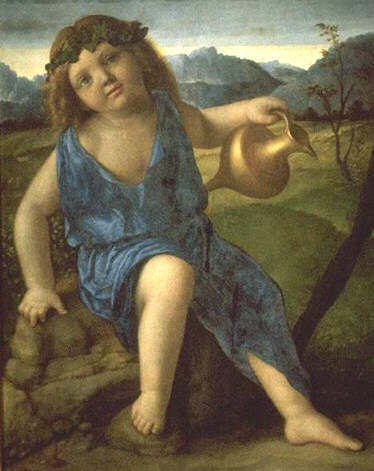 Otherwise, meditate, invoke your fertility and “love” deities, divine, drink, eat, be merry, make love in honor of the Gods who made us, who love us and sustain us, still – despite everything we are doing to their worlds – but don’t banish them with silly fear-filled rituals originating in a monotheist religion foreign to us (and basically foreign to life itself). A popular recipe from early medieval times is the “Walpurgisbowle” or “Waldmeisterbowle” (woodruff punch). 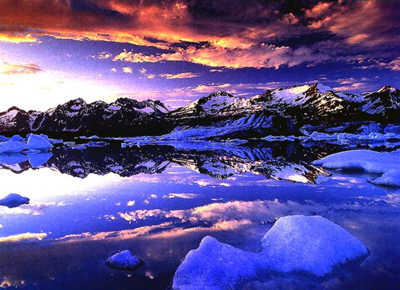 It was said to grant everyone who consumes it “the freedom to fly, imagine the future, see (reflect) on the past. (Of course the amount of sugar ensures that you will get drunk rather soon, the punch itself has a similar effect as Absinth has, meaning it will get you “high”) and Basically this punch consists of half a quart (500ml) white wine, half a quart (500ml) champagine, 1 ounce (approx. 30g) of sugar and a handful of woodruff leaves. This is the second part of the Germanic Women series. In the first part the role of the Sibyllen/Völvas, Matrons, Norns and Disir were covered. The Walküren once were more than just „Wotan’s Wishmaidens“. 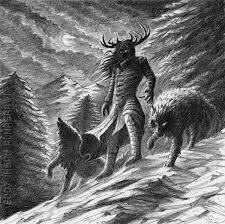 The independent guardian spirits of the dead suddenly had a stern, “all-powerful” master in Wotan, and were not good for much else than to fulfill his personal demands and act on his whims. The origins of the Walküren lie in the pre indo-Germanic mother/Goddess cult. Their name alone sparks terror, for Old Norse valkyrjar and Old English waelcyrge mean those who choose the corpses (from the battlefield) or literally “corpse-chooser”. 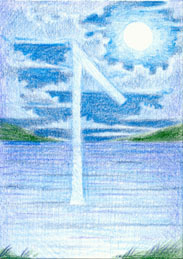 The only account regarding the original independent nature of the Walküren is found in the Njalssaga. It speaks of twelve females sitting at a weaving chair inside a mound. Their weaving wool is made of human intestines, the weights for looms are made up of male skulls. They are singing a song about harvesting the warriors on a battlefield. It is insinuated that while they are sitting inside the mound weaving the warriors’ fates they are at the same time present on the battlefield itself. 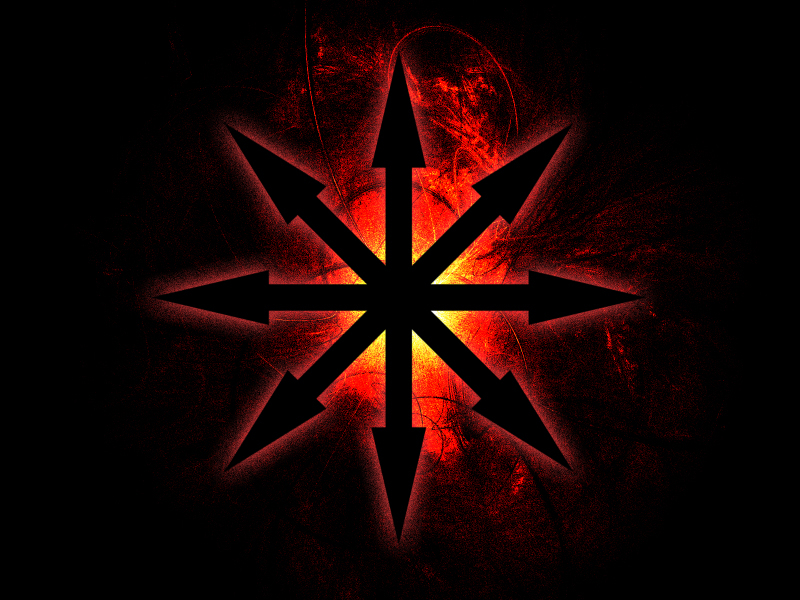 Like the Nornen the Walküren alone decide what to weave, what warriors, both male and female, to choose and who to spare. Neither prayer nor offering will change their decision; they are independent and do not answer to any God such as Wotan, let alone humans. As already mentioned their independence was taken from them later on; but even worse, in Medieval Skaldic Poetry the Walküren are described as lowering themselves enough to fall in love with mortals. These beings obviously have nothing in common with the strong, independent female guardian spirits that once wove the fates of warriors; instead they let humans determine theirs (!) 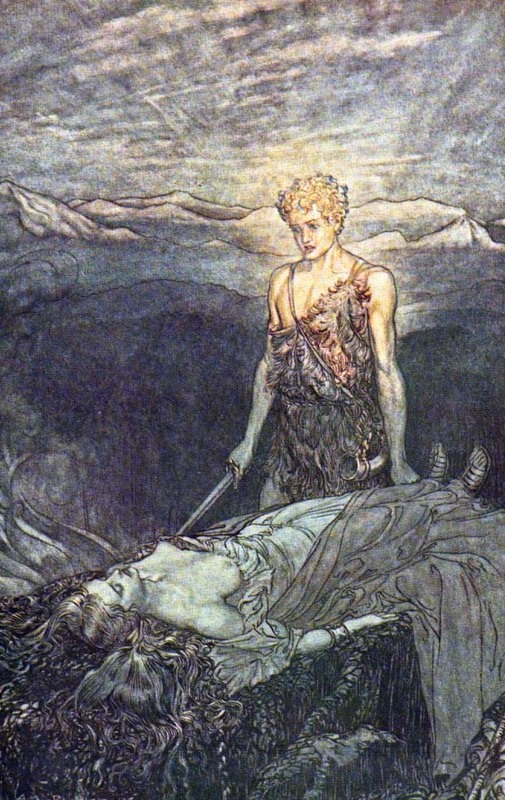 as the story of Brünhilde and Siegfried (Das Nibelungenlied) shows. This particular storyline of the Nibelungs is especially interesting as it points to the death of the Mother Goddess cult, which did not suit the rigid and patriarchal structures of Medieval, and most importantly increasingly Christian, society. In the course of the story Brünhilde the Walküre is betrayed and dethroned by men. Still, as long as she is in possession of her magical belt, she remains independent to a degree. Siegfried and Gunther trick her, forcing off her belt and Siegfried rapes her in front of her husband, Gunther. The matriarch is dead, figuratively speaking, and as she falls and the balance between male and female rule is destroyed, thus falls all of mankind: The saga of the Nibelungs ends with an inferno no one survives, a kind of Ragnarök on a smaller scale. The same principle can be found in Véølundarkvipa. Here, as much as in several folk tales, the Walküren are depicted as swans. The swan, representing purity both spiritually as well as physically, was also associated with the soul and death in general. 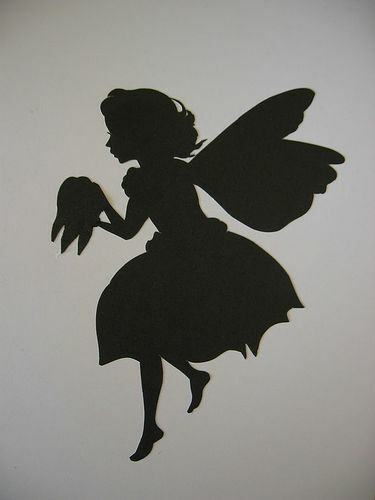 In Véølundarkvipa the swan girls fly through the dark forest to “ørlog drýgja” – decide (clan/family) fate. They sit down at a lake, taking off their wings and feathers to “weave fine linen”, in other words they weave the fate(s) of the warriors on the battlefield. Wölund and his brothers steal their feathers and force them to take them as husbands. 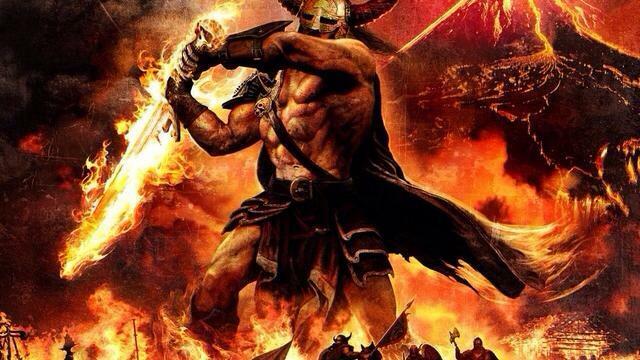 7 years go by in which the Walküren yearn to return to weaving the fates of the warriors. In the 8th year they plot their escape, in the 9th year (note the sacred number 9 in this context) they leave behind their captors and children to become what they once were. This, of course, is a bit of a happier ending, if only slightly. 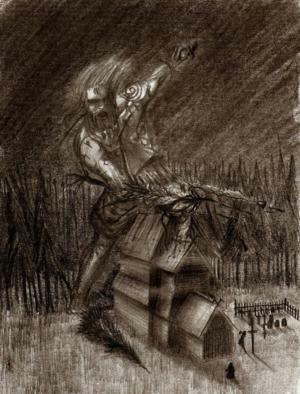 There is also an Anglo-Saxon blessing in which the Walküren are basically described as a witch army riding in the sky and casting their spears down into the warriors’s backs, claiming them thus. The (German) Saxons held a similar view of the Walküren and so even in today’s German we use the word Hexenschuß (“witch shot”) for lumbalgia. Are the Walküren Hlokk (“restraint/chain”) and Herfjotr (“fetter”) described in this charm? 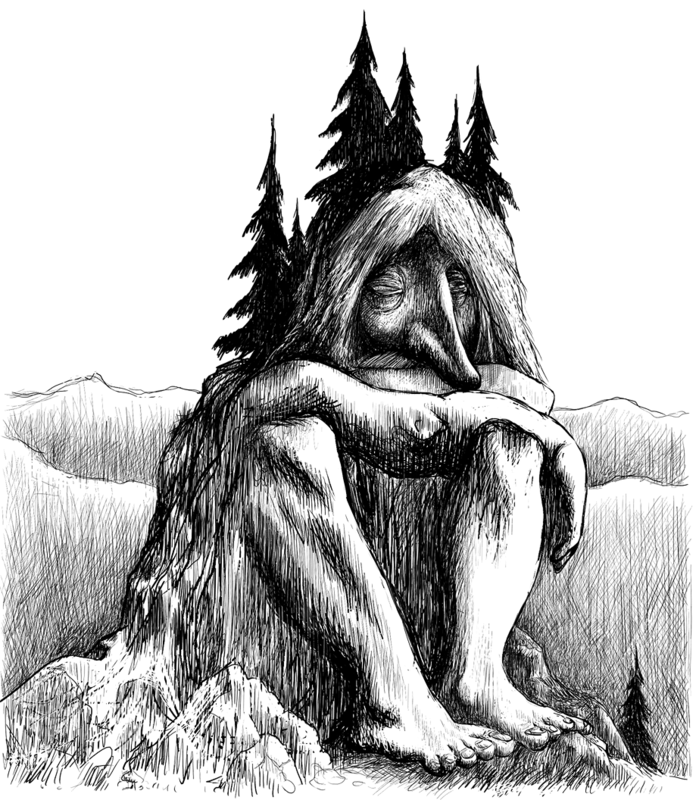 It becomes clear that the idea of Idisen, Walküren, Nornen, Alrunen (witches), anthropomorphic Fylgjen, Hamingjen and others all seem to have influenced each other to some degree; it can be tricky to distinguish between them nowadays because contemporary Norse and Germanic Pagans mostly don’t make the same tribal distinctions between Gods, beings and practices anymore as was common in the old days. 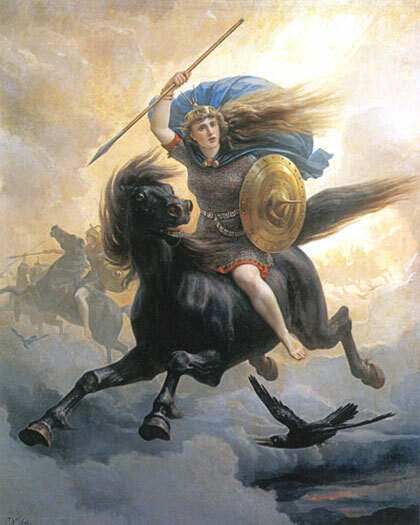 To shed some light on the Idisen/Walküren mystery though: In Germany the Norse Valkyries were adopted from the Norse and the Idisen turned into meek, benevolent female spirits, often ancestral spirits. There is a common misconception amongst the majority of today’s witches that everything was peachy for witches in “ye olden days”. This is not completely the case with the Germanic peoples. There were Healers and Herbalists, those we would call Naturopaths today. 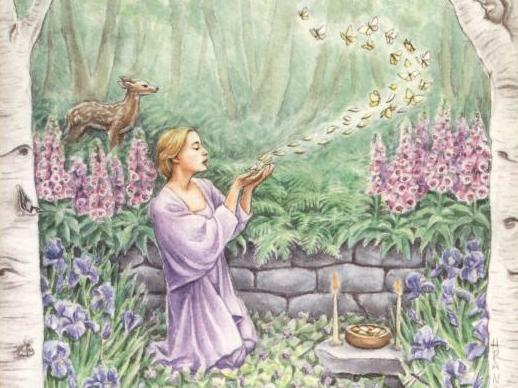 They applied their potions, crèmes and herbs while whispering charms or prayers. Healing used to be a solely female occupation and was passed on from mother, aunt or grandmother to the younger female generation of one family; there are no accounts of male healers from those times at all. Under certain circumstances women could fight alongside the men on the battlefields, yet men were barred from entering the areas of “female mysteries” without exception. Countless accounts from Viking times mention that the Germanic healers that accompanied their army or troop set up their tents near the battlefield and treated both their own men as well as the hostile warriors. They treated them no differently and if need arose, they buried them and spoke a blessing over their grave as well. 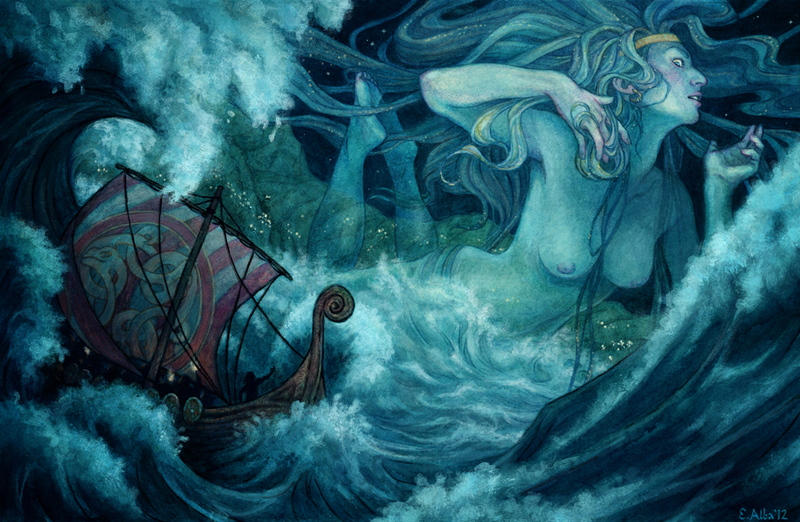 “Halldora called her women to follow her into the battle between Glums against Thorarinn. – “We shall tend to the wounds of the men who are still filled with life, no matter which army they are from”. The story mentions another interesting belief from those days; healers could not only heal but resurrect the dead as Helga did with Thorarinn. What might the mighty Walküren have thought of this? Or did this happen in accordance with them? Another thought comes to mind. – What of Iduna and her “magical” (healing) apples? 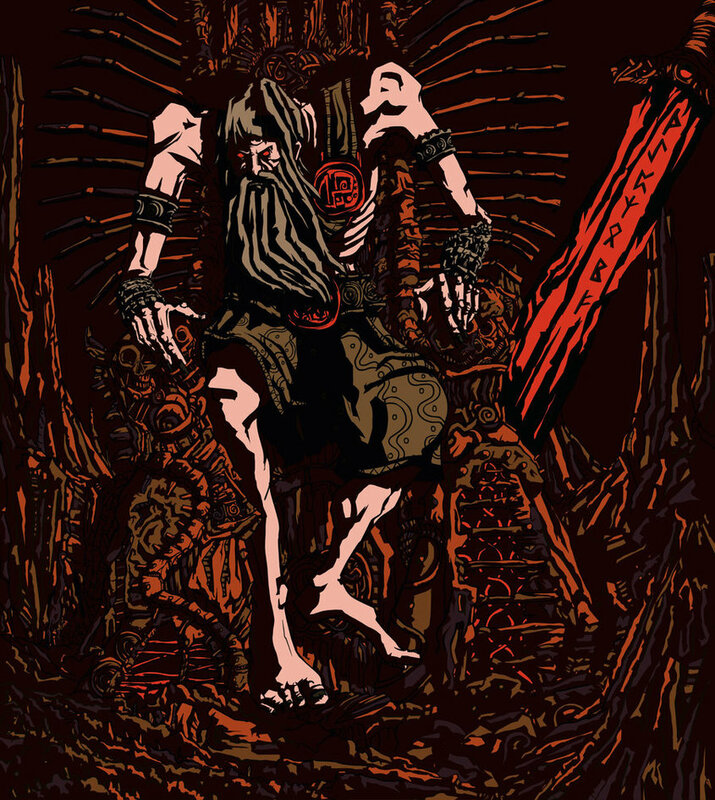 Once the Asen Gods did not have them at their disposal they grew old and withered. Had Iduna not returned in time to rejuvenate them and they had died, would she have been able to resurrect them as well? It is Eir that is the healer amongst the Asen, but not even she holds the power to resurrect the dead. This truly is a practice that reeks of witchcraft rather than (natural) healing. Many unanswered questions remain when it comes to “loopholes” in the usually very structured Germanic belief system of old. 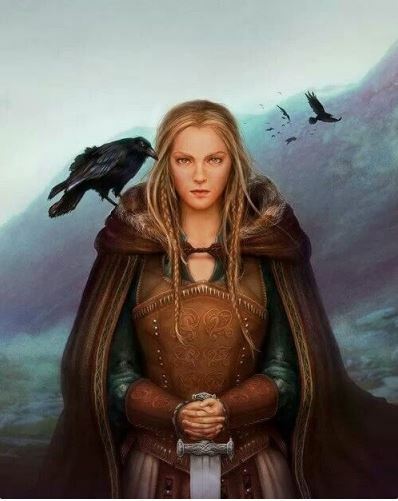 The Völven (aka Sibyllen, Spákonur, Wicce – Wise Women/Seers), already mentioned in part 1, often traveled from Hof (farm) to Hof, offering their services and in return demanding food and shelter until they journeyed on. Whether these women, who were often called to mediate between two opposing tribes or political factions within one tribe, possessed actual magical powers or were mainly mentalists with exceptional power of observations is a matter of interpretation I presume. 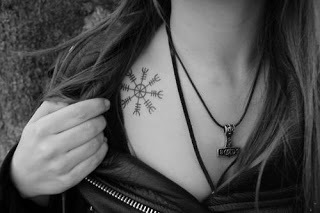 They did, however, consult the runes (as described in the accounts of the battle between Sueban king Ariovist against Cesar 58 BC for example) and worked with other oracles and incantations called vardlokkur (spirit-luring) in Old Norse. The lines were blurred between Völven and Wîsiu Wîp, wise women, as they were called in German and Spákonur (seeing women) in Old Norse. 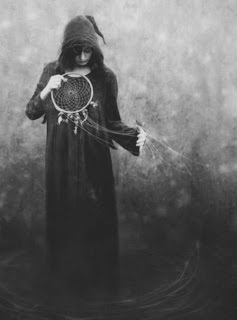 Divination was regarded as a high magical art indeed, yet witchcraft was also often viewed as harmful and dangerous as it was a direct infringement onto the personal wyrd and orlog of a person. The further the North was christianized the more Christianity influenced the beliefs of those who remained Pagan. Had they already been skeptical and partly fearful of certain types of witchcraft, they now fell prey to the mass-hysteria and bottomless fear of witches; they persecuted and banished those accused of practicing magic almost as much as the Christians did. There were many different names for witches, specifying what kind of witchcraft they practiced. The more Christianity wreaked havoc the more negative connotations these originally rather neutral names received. 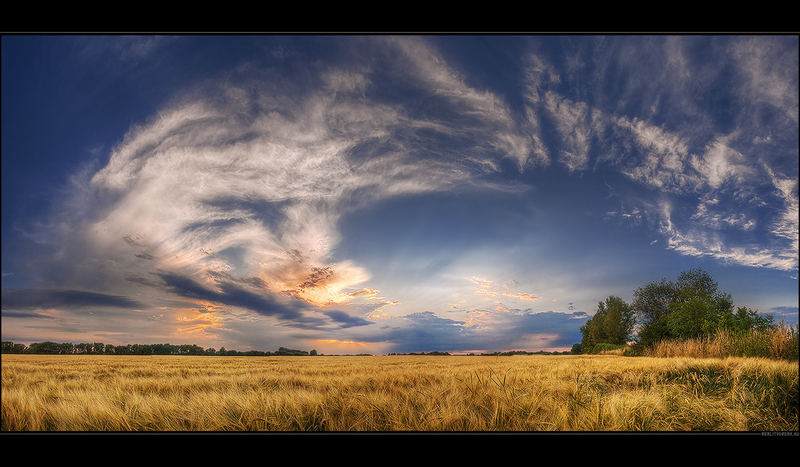 The word Haegse originally meant fence-seer in Old High German. It was related to the Old High German word Hagazussa meaning fence-sitter and the Old Norse word Túnridur meaning fence-rider. 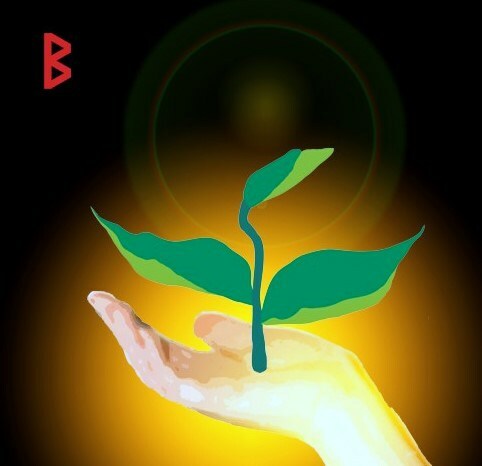 Both are pointing to the Shamanic practice of traveling between the worlds. 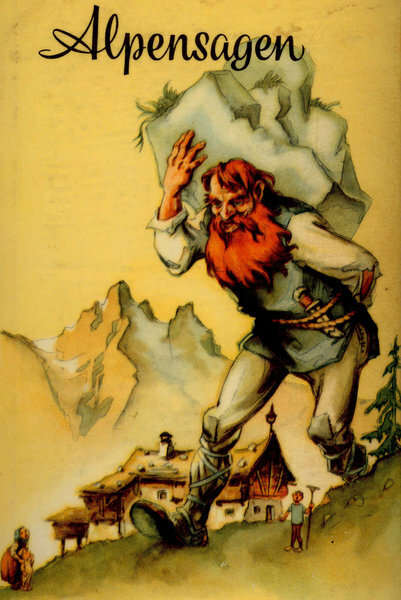 Later, however, the Haegsen and Hagazussen were suddenly described as being monstrous, evil magic-weavers living in the deep, dark forest and coming out at night to plague and harm common people. 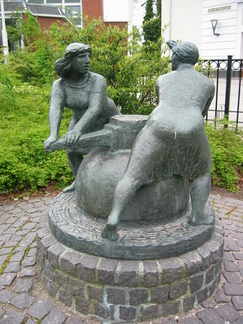 The word fence-sitter or fence-rider was reinterpreted as meaning that the witches were breaking the “Hoffrieden” (literally: farm-peace) and destroying the sacred barriers (fences) of the community against unlucky and negative forces. 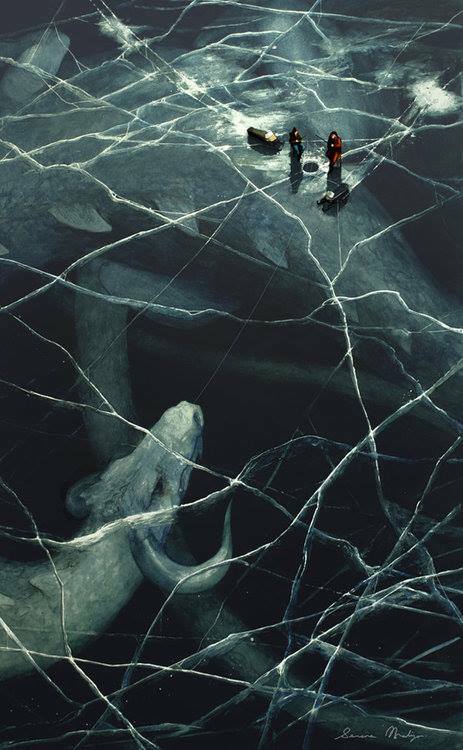 Likewise the terms Myrkridur (Old Norse: Darkrider), Kveldridur (Old Norse: Eveningriders), or Nahtvrouwen (Old High German: Nightwomen) were also reinterpreted to mean something solely negative and sinister, instead of describing the practice of diving into the “dark”, i.e. 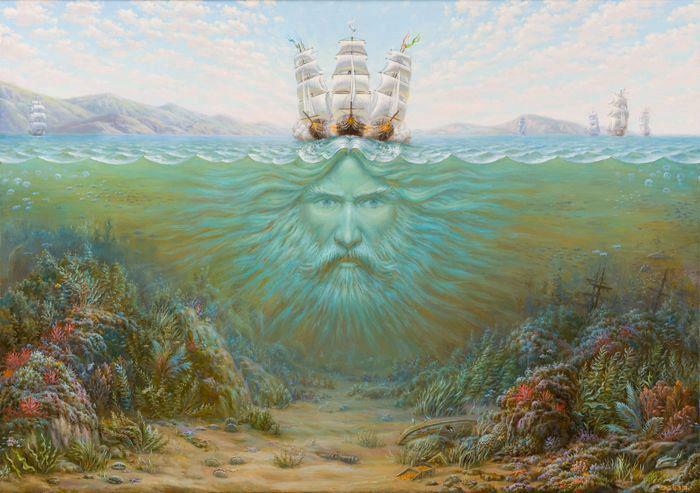 subconscious powers within via Shamanic or other magical journeys. 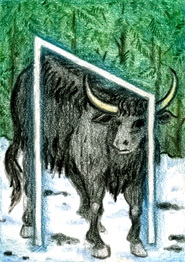 The Hamhleypa (Icelandic: Running into a different Shape = shapeshifter) were accused of transforming into an animal and bringing on hail, storms, being responsible for a bad harvest, the death of cattle or children. These misconceptions about witches lived far beyond the middle ages and frighteningly are embraced by a majority of the followers of the monotheistic religions to this day. The author of the Hávamál, the Icelander Snorri Sturlason, was a Christian who lived in a completely Christian society already, so his accounts of witches (and alleged incantations warding them off) better be taken with a grain of salt. 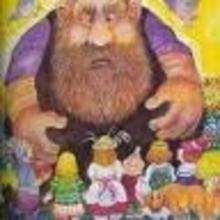 Similar to the Hamhleypa was the practice of Hamfór and Gandreiðr. 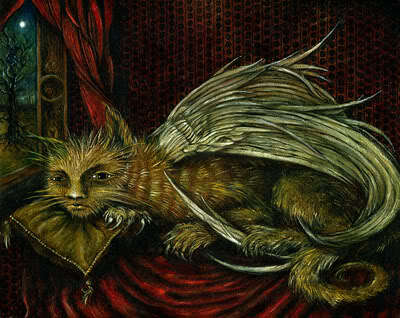 As mentioned in part 1, a Gand or Gander was a kind of wand, but Gandr also meant spirit, ghost, other-worldly creature. A Gandreiðr was “spirit-riding”, basically a magical, Shamanic journey during which you could see your past, present or future in a different light. Likewise the Hamfór was a spiritual journey during which your soul left the body and traveled through different spheres to gather information. 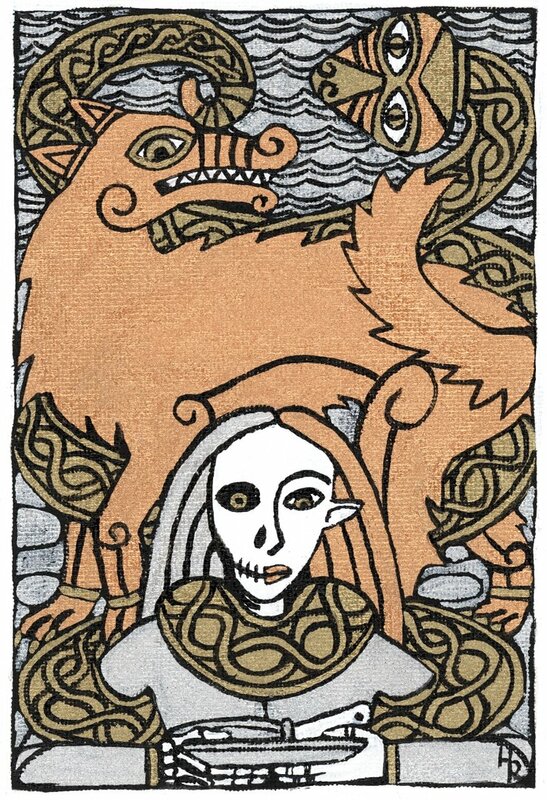 The giantess Hyrrokin was described as riding on a wolf (gezäumt) with snakes when attending Balder’s funeral. Hyrrokin is sometimes equated with Angerboda. 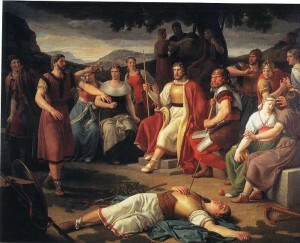 Did Angerboda-Hyrrokin attend Balder’s funeral during her Gandreid in order to see or secure his future after Ragnarök? If not by her consort Loki’s doing, Balder would not have been kept safe by Hel during the end battle so he could return to the New World afterwards. 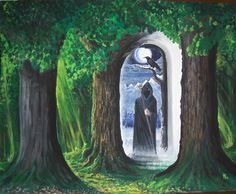 Other names for witches were Alrunen (all-whisperers/rune-expert), Heid (clear, bright), Fordoeða (Murderer), Wicce (pronounced “witcheh”. 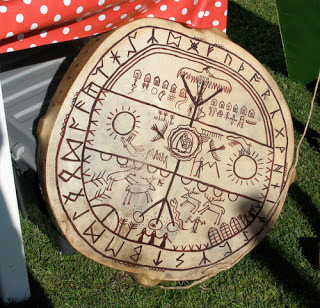 Anglo-Saxon: knowledgable, wise, from which the modern term “Wicca” comes from), Anglo-Saxon Witega (knowing signs), Old High German Wizago (German: “Weissager”) and Old Norse Vitki all describe someone who is knowledgeable in the art of divination (usually conducted with runes). 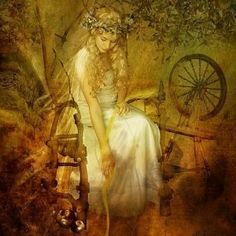 The Old Norse word Galster is related to Old High German Kalstahari, a term for someone who knows how to sing the magical songs, the vardulokkur or galdralát as described above. Although there are some historians and scholars who insist that all witchcraft was persecuted pre-Christian times, the different descriptions and attributes of the different terms for ‘witch’ indicate otherwise. 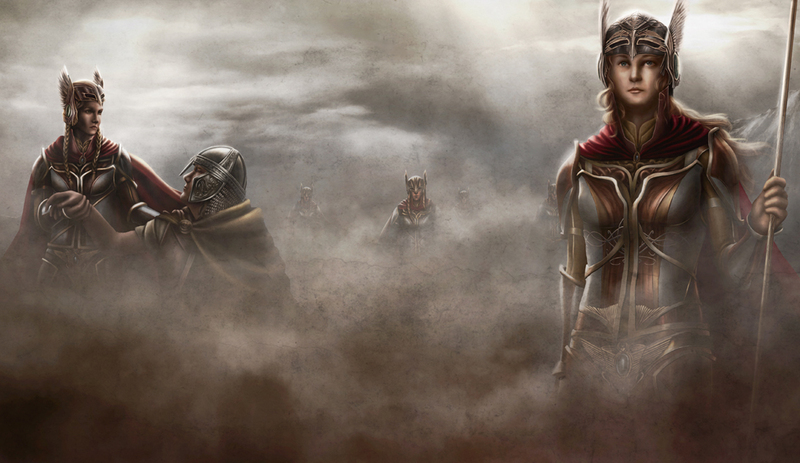 After all several Gods (Freija, Holle-Frigga, Iduna, etc. ), Jöten and Thursen (Hyrrokin, Heid, Gullveig, Elli, Fenja and Menja, etc.) 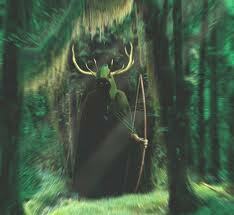 and wights practice magic and/or witchcraft without any negative connotation in lore. 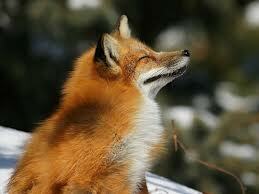 The Völva of the Völuspa, Heidi, is human even and both humanity as well as Gods were grateful for her messages. 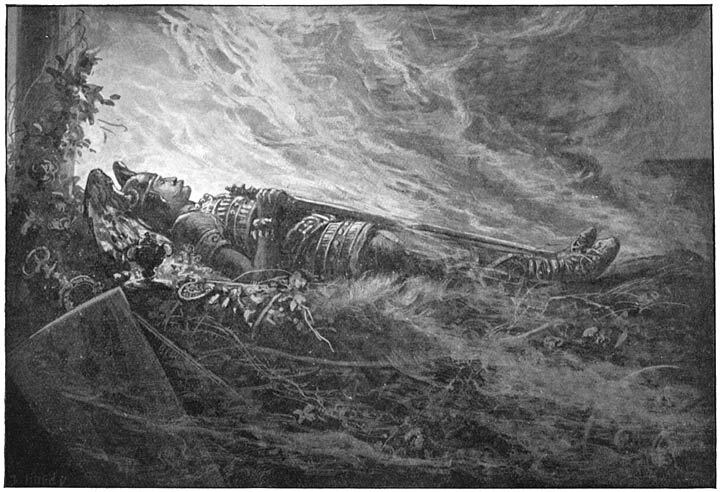 The Edda teaches that Wotan even crossed the social taboo of forcing himself into the sacred space of female mysteries such as healing, witchcraft and divination; he learned the “womanly” art of Seid, the art of divining with the help of the spirits (of the deceased), something that Völven traveling from Hof to Hof also often engaged in. 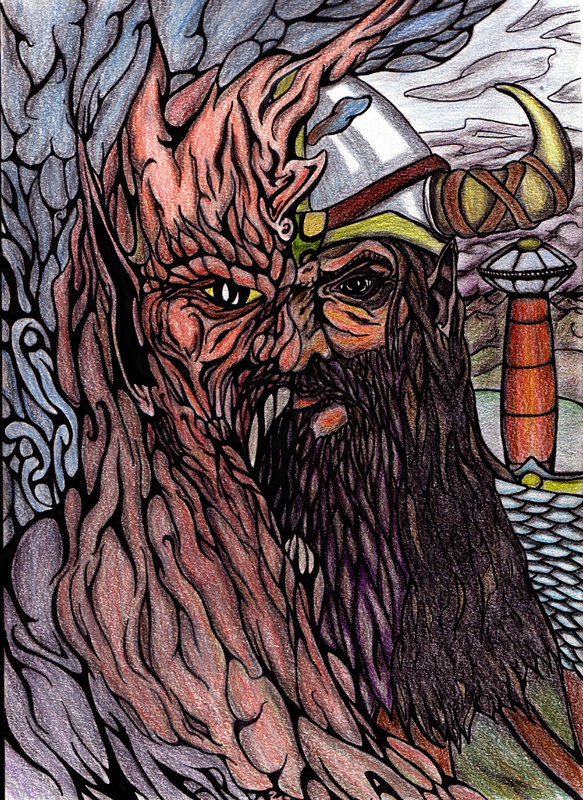 However, Seid (Old Norse: Seidhr) became popular enough for several males to become Seidmen. These men were often looked down upon, probably because this “womanly” practice was of female Wanen origin and it was mentioned that the war-happy Asen were helpless against the Seid magic of the Wanen deities. Seid could also be used against people as described in the stories of the witch Busla who curses a king with galdr to do her bidding and in Laxdoelasaga it is the farmer Thorleikr who asks the witch Grima to help him curse his neighbor. In both cases the witches cursed the men while they were asleep and helpless, something that influenced the medieval (Christianized) belief of “demonic” Alben riding people’s chests at night in order to cause bad dreams and bad luck. Since the Germanic peoples were all highly virtuous and incredibly brave folks with a strong morale of right and wrong it comes as no surprise that such cowardly practices that avoided a fair and open fight were condemned and despised. In fact, they were even punishable by fine or in the case of Ragnvold in the Förnmannasaga it was even punishable by death. 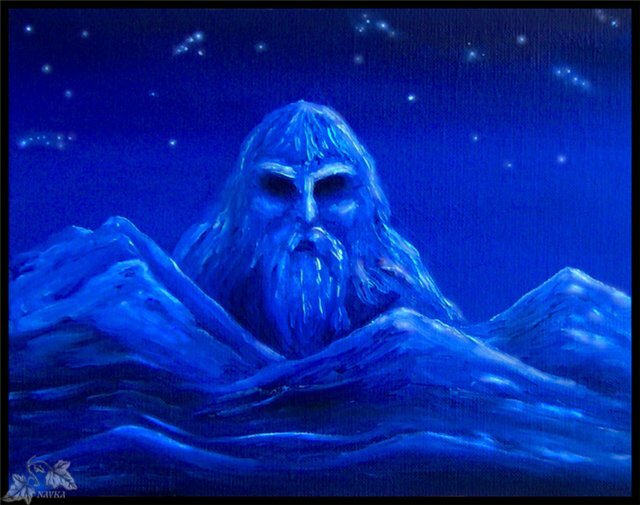 It’s also possible that Seid, “death magic”, was also feared more than other forms of divination, because of the old Germanic belief in aptrgangr, draugr, other kinds of revenants and ghostly beings out to harm humans. 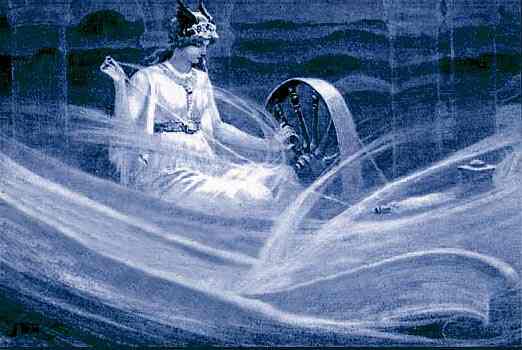 Seid is often described as being accompanied by heavy storms, the Gerningaveðr (magical weather). In later times people were of the opinion that only evil magic brought on such storms. 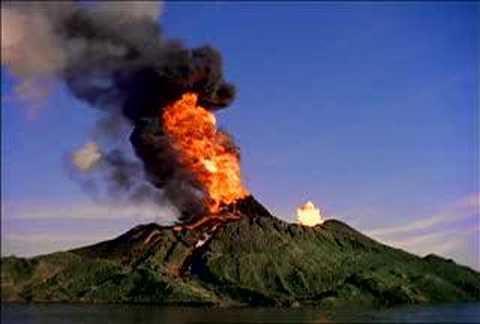 Yet…where was Thor when his domain was invaded like this? Is this just an indication that the Gods did not intervene unasked, much like nowadays when we pollute and destroy the earth given to us, or that while humans viewed such witchcraft and storms as evil the Gods did not? Who knows. Fact is that even in today’s Germany we know the term Wetterhexe (weather witch) which is used either to describe meteorologists but also people very sensitive to the weather, and is not associated with anything harmful or negative (anymore). 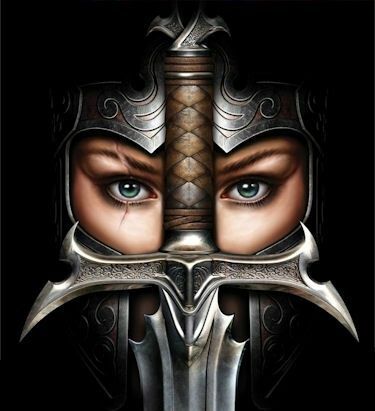 There were active and passive female warriors. The passive warriors accompanied their tribe’s army or troop and cheered them on from the sidelines of the battlefield. Plutarch writes that during one particular battle the Teutonic warriors tried to retreat. Their women ran at them with axes and swords, fighting them – the traitors – as much as their enemies, the Romans. This appears to be a common phenomenon amongst the Germanic tribes as Tacitus in his “Germania” and Cesar in his “De Bello Gallico” confirm. Furthermore, Tacitus writes that the women used psychological warfare against their own men by shouting at them to spare them and the children the humiliation of Roman captivity and all the gruesomeness it entailed. If their men fought successfully the Germanic women would bear their breasts and shake them so as to keep up the motivation of the warriors. 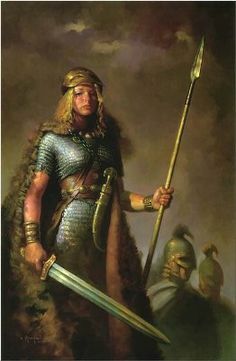 Active female warriors (“shieldmaidens”) often bore names ending with or including the syllables wig, hild, gund, gart, hadu, ger (spear), brünne, helm (helm) etc. They were found in all known Germanic and Scandinavian tribes. Were they raised to become warriors or did they choose their (warrior) names later on as they decided to join the army? Even in the saga of Erik the Red we hear of brave Freydis, the pregnant wife of a warrior, who actively joins the battle, fighting with exposed breasts. Something that confused and frightens the enemies so much that they escape as quickly as possible. 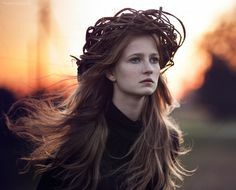 Two factors influenced the drastic change in Pagan Germanic societal structure in which women had had a relatively good standing: The diffusion of the Wotan cult and the increasing contact with the Christian Romans who did not grant any rights to women. 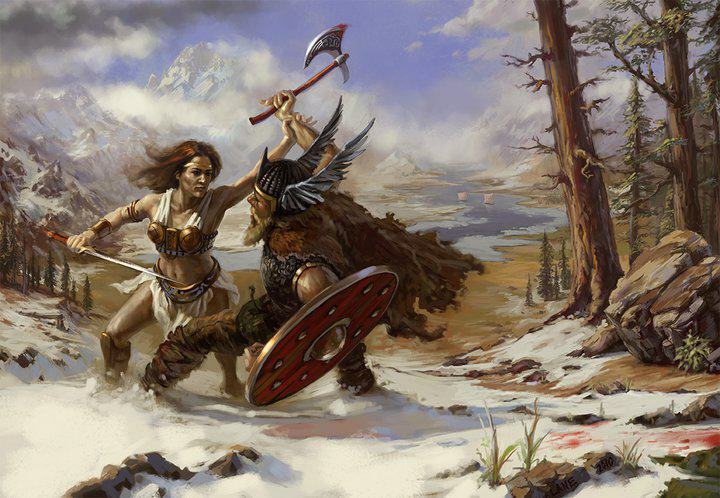 Before the Winniles had accepted the Wotan cult and renamed themselves Langobards their women had had the right to carry swords, axes and other weaponry and use it as well. If not for them, they would not have defeated the Vandals. However, in 568, after they had settled in Northern Italy, they enacted laws that clearly stated that women were absolutely forbidden to carry or use weapons. Either due to societal change or by (Christian) law and conversion, one after another all Germanic tribes began treating their women as second-class citizens without any rights, feelings nor wits. The beginning of the dark age.